The Full Moon has been just breath taking to watch in the last few nights. This event has been captured brilliantly last night in Wellington by Weta Digital artist Mark Gee. Stunning real-time footage of the moon rising over the Mount Victoria lookout. Thanks for sharing Mark, you're a genius! As you can read below the Catalogue introduction has as much 'hooray henry' as the Checklist description and someone must have told the writer of both to stick to the facts, or perhaps its just a display of the hybridiser's modesty . This is an iris that I purchased from a seller on 'Trade Me' last season and I am mighty glad I did. A ¼ bred oncogelia hybrid, intermediate in height strong stalks that display smallish blooms that are pleasing on the eye, blooms have a nice sheen that highlights a broken colour maroon purple flecking adding to the intensity of the mixed colours certainly draws the garden visitor towards the bloom . Strong plant growth very rounded blooms. A cross of a standard dwarf iris as the pod parent and the pollen parent is the ½ bred oncogelia hybrid 'Tabriz' a winner of 'Clarence G. White Award'. Very Early, Blooms with the SDB but even with only first year growth has a long bloom period, and is a must see should you want your definition of beige to change. If you find it for sale on Trade Me or if you have to add it to your order from Richmond Iris Garden, Buy it! It's an exotic look you'll love. Based purely on merit this is an iris that should be in the NZ Dykes Test Garden and would be a winner. 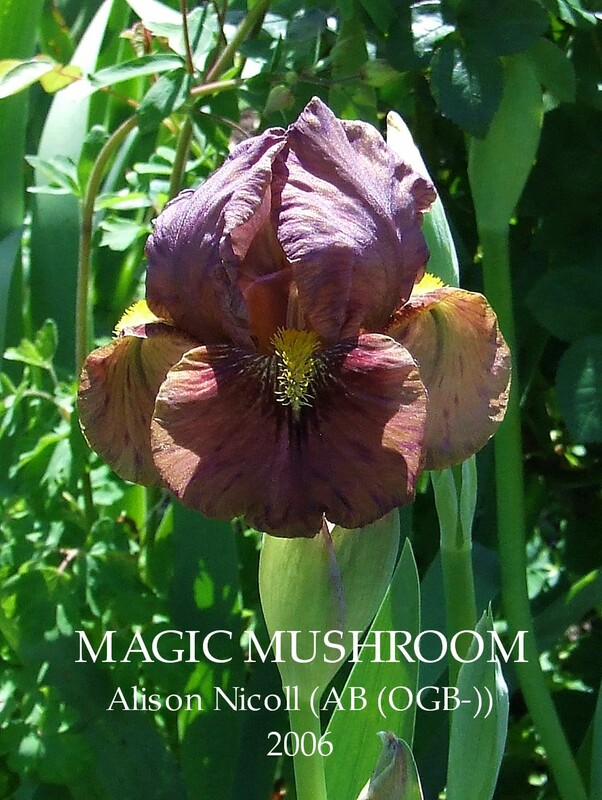 MAGIC MUSHROOM: AB ( A. Nicoll '06) Standards purple flecking over beige, falls old gold washed purple with maroon veining around beards. MAGIC MUSHROOM Alison Nicoll, Reg.,2006. Sdlg. AO2D5-4. AB (OGB-), 17", (43cm), M ; Standards beige, purple flecking; style arms old gold, bluish centre line; Falls old gold over washed purple, maroon-red veining around gold beard. Adoring Glances X Tabriz. Richmond Iris Gardens 2008/09. This is an Iris that has a quirky History+. Mr Stanley Foote (USA) the originator while on a visit to New Zealand stayed at the Hermitage Hotel, Mt. 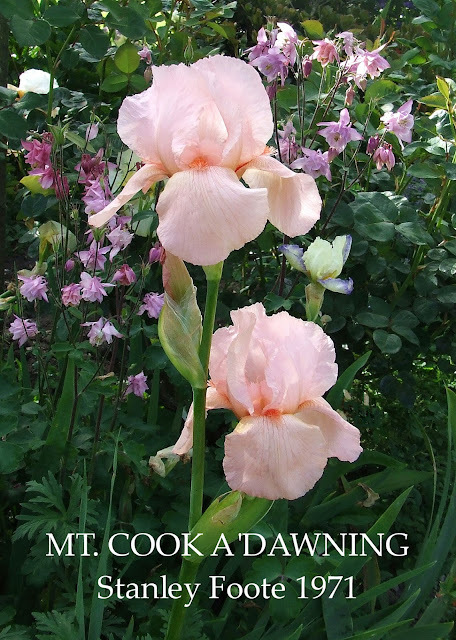 Cook, having seen the the rising sun's rosy rays on the snowy mountain he reportedly vowed that if he ever bred a pink iris it would be named for this unforgettable sight. A great garden Iris that performs well. Its one of the few Pinks that I grow. Jean Collins Iris Garden, Cambridge Road, R.D.1 Tauranga. MT. COOK A'DAWNING. Deep pink self, tangerine beards. Mid Season. MT. COOK A'DAWNING Stanley Foote, Reg. 1971 Sdlg. 66-2-3. TB, 30-34" (71-86 cm), M Deep pink self; tangerine-red beard. Remembered Melody X One Desire. Foote 1972. Two of the greatest rich gold tall bearded irises growing at home are 'Pirates Quest' (Schreiner '91) an early bloomer and the late blooming 'Zillionare' both '90's vintage Irises. A great golden eye catcher that is a pleasing end to the Tall Bearded season. The texture is velvety gold,the form is wide, flared and ruffled and stands up well to rough spring weather. Bloom season extends over several weeks. 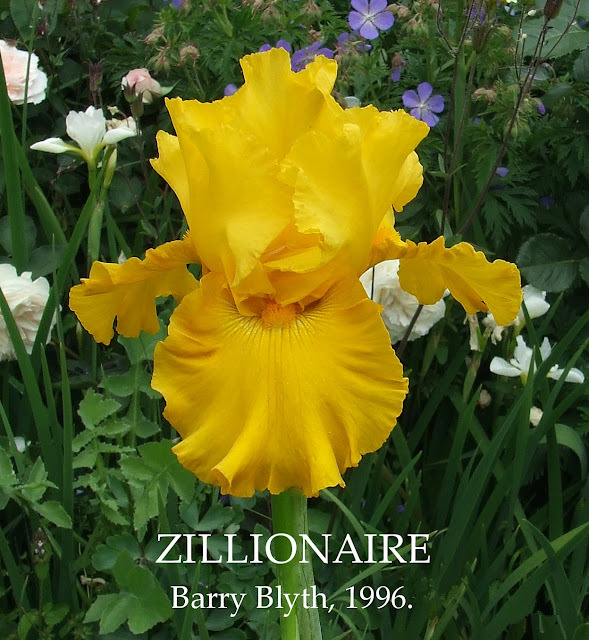 As a measure of this Iris worth is that Barry Blyth still listed 'Zillionare' in his Tempo Two Catalogue 10 years after its introduction and as anyone who receives Barry's catalogues on a regular basis will tell you Irises very rarely last that long in the 'Tempo Two' General Listing section. Tempo Two, Pearcedale, Victoria. 1996-97 Iris, Daylilies, Hostas, Catalogue. ZILLIONAIRE Barry Blyth, Reg 1996, Sdlg. A63-8. TB, 38" (97 cm), ML Standards rich gold; Falls deeper gold, faint tan shading; beards mustard gold; slight fragrance. Dance Man X Rembrandt Magic. Tempo Two 1996/97. Available in New Zealand from Glanavon Iris Patch, Gisborne, see link in New Zealand Iris Growers tab above. 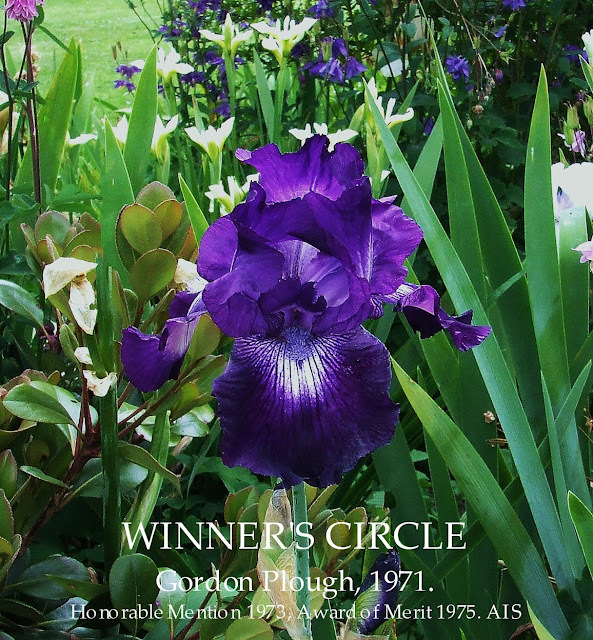 I first viewed 'Winner's Circle' with much admiration many years ago in the iris display gardens of 'Bay Blooms' Tauranga. I have never seen it listed in any commercial growers catalogue in New Zealand for the last fifteen or so years, and it had me thinking it had just disappeared for good. Fortunately this past bloom season I was lucky to see it blooming in not one but two gardens in the Wairarapa and got to bring several starts back home ( Now there's a Yippee-yi-o-ki-yay moment). Standards are a dark pontiff purple and have a white infusion up through the centre. Falls I find are slightly darker toned with a velvety sheen and have that distinctive white circle rayed out from the vivid violet beard as its signature. . Bloom was smaller and stem height shorter than the registered and catalogue descriptions due to plants growing in overcrowded Iris beds in the garden I viewed (almost had the hallmarks of a Border Bearded iris) but it has just bolted away now growing without the competition at home. Fertile as a pod parent. Sibling to 'Night Out'. Joins some others of this distinctive style 'Speed Limit'(Lauer, '91),'Cocktail Hour'(Robert Dunn '82), 'City Lights'(Mary Dunn,'90), and 'Exotic Star' (Plough,'74) in the garden. A very classy looking variety with standards of a dusky, blackish-violet and falls that are the same colour but with a round white flash below the beard. Flaring flowers on branched stems. WINNER'S CIRCLE (G. Plough, R. 1971) Sdlg. 66-73-7. TB, 34" (86 cm), E-L Standards deep blackish violet; Falls same with 1" round white flash below beard. Wintry Night X Stepping Out. Eden Road 1972. HM 1973, AM 1975. I purchased this Iris from Shirley Spicer when I visited her last summer at her home in Wanganui. An all-round good garden variety, nice clean foliage with strong increase clumping up quickly 'Salute D'Amour' is a almond pink blend (RHS19D Pale Orangish Yellow) in the tradition of 'Mittagong' (Grosvenor, 1989) but with much more clarity and strength of colour. Falls slightly darker than the standards gradually lighten in the centre just below the light yellowish pink beards (RHS27A). Good strong stalks of a average height with nice open branching that display well the frequently open multiple blooms, however the standards do concern me as they are very upright and tight and have a tendency to get stuck when trying to unfurl which is never a good look. 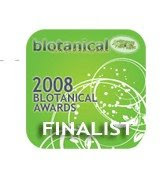 Awarded the New Zealand Dykes Medal in 2003. Just a little bump in the road I cannot find someone who sells this iris in New Zealand today! Waimate Iris Garden, Waimate, South Canterbury , 2006 Catalogue. A delightful mix of coral and light and warm pink. Beards coral. Sweet fragrance. L.
SALUTE D'AMOUR Shirley Spicer, Reg., 2001. Sdlg. SS/29. TB, 33″, (84cm), L ; S. light pink blush; style arms soft coral pink; F. warm pink blush, soft white haft marking; beards coral; sweet fragrance. Elysian Fields x Flirtation Waltz. Waimate Iris Garden 2006. Dykes Medal 2003 NZ. The New Zealand Iris Society Checklist 2007 notes 'Salute D'Amour' was awarded the Dykes Medal in 2003, the British Iris Society Year Book 2004 confirms this date on page 108, the NZIS bulletin 165, March 2005, page 10, is an in-depth report on 'Salute D'Amour' award and the headline reads 'The New Zealand Dykes Medal 2003', but on page 32 in the same bulletin under the heading 'For Sale- Dykes Trail Gardens Irises', it states "Rhizomes of 'Salute D'Amour' the 2004 Dykes Medal winner bred by Shirley Spicer, salmond pink can be purchased for $21.00 each". 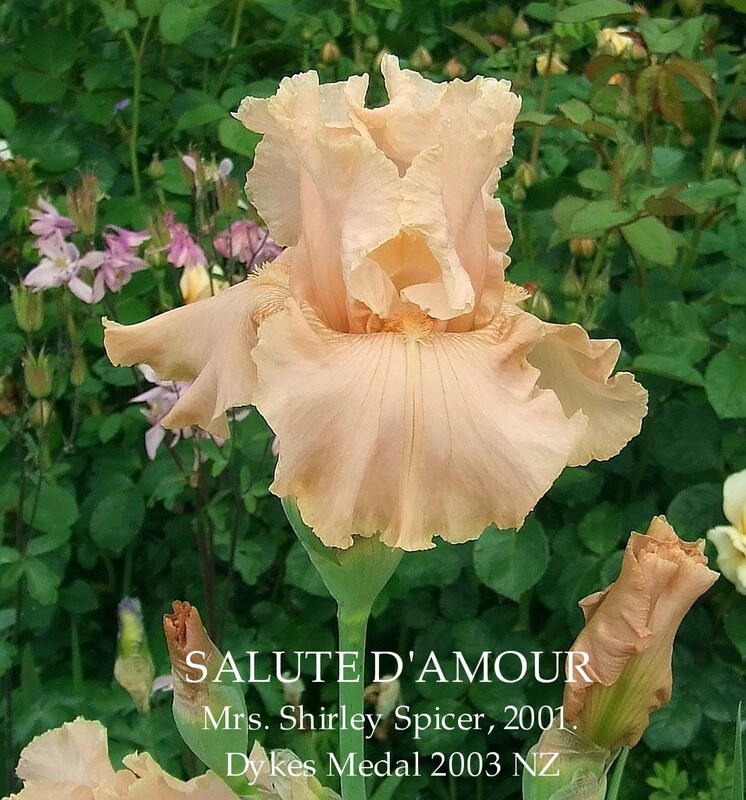 Finally there is the much vaunted for its accuracy 'Iris wiki encyclopedia thing' that has 'Salute D'Amour' listed as having been awarded 'New Zealand Dykes Medal 2005'. What can I say??? Ready for the advanced iris aptitude test?? I really do like Irises of this colouration. This is an iris with just slightly better than average increase and the photo shows I hope that 'Good Vibration' with its moderate sized flowers on iron rod stems have that 'cool detached symphony meets iris eye candy' look about it. If you can find this iris I recommend you buy it, growing into a large clump it will give any garden that special look, you'll love it . Schreiner's, Salem,Oregon, 75th Diamond Anniversary, 2000 Iris Lovers Catalog. 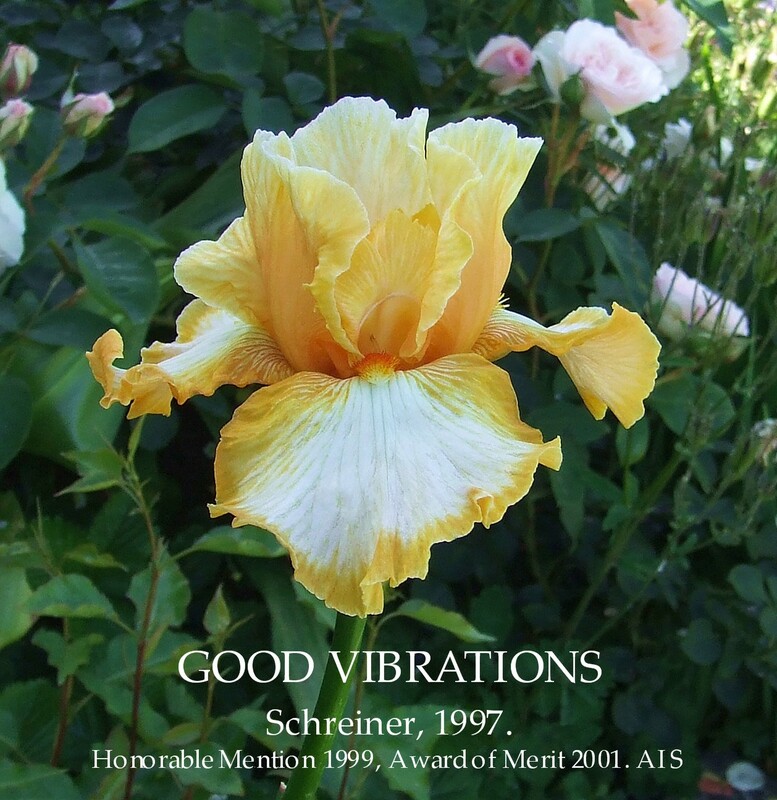 GOOD VIBRATIONS (Schreiner 1997) ML. 37"
Good Vibrations brings a unique new color combination to the Iris family. Note the 1/2" band of apricot-orange that contrasts the pristine white centers of the flaring falls. The same warm apricot tones uniformly tint the erect standards. Strong stems easily support 7-8 buds in all sorts of weather. GOOD VIBRATIONS (Schreiner '97 USA) ML 37" Light tangerine orange standards and white falls edged with a half inch band of tangerine orange. Beards are tangerine. Lightly ruffled blooms on show stems. Weather resistant. (Inv. Flaming Light, Oraglow, Celestial Glory etc.) HM99 AM01. GOOD VIBRATIONS Schreiner, Reg. 1997 Sdlg. DD 753-A. TB, 37" (94 cm), ML Styles and style arms tangerine orange (RHS 24B); Falls white (155D), 1/2" tangerine orange marginal band; beards tangerine, white at end; ruffled; slight fragrance. W 752-2: (S 656-1: ((Pinafore Pink x (Oraglow x unknown)) x (Something Else x (((R 16-2 x Celestial Glory) x Flaming Star) x Gold Trimmings))) x N 720-1: (((Fairy Fable x Christmas Time) x Party Look) x Flaming Light)) X Y 716-A: (R 513-7: (Fiery Chariot x (((((June Meredith x Lynn Hall) x Fairy Fable) x Esther Fay) x Bright Butterfly) x Flaming Day)) x S 656-1). Schreiner 1997. HM 1999, AM 2001.